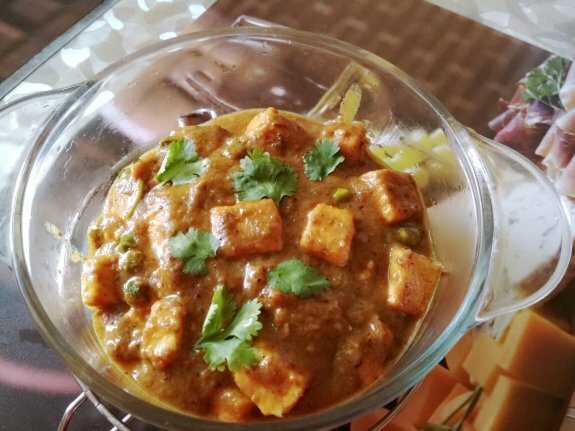 Matar Paneer is one of the delicious and healthy combination of soft paneer(cottage Cheese) and Matar in a little spicy based gravy which is really give a treat to your taste buds. The shallow fry paneer cubes with this irresistibly tasty curry give a great change in your daily menu. 1. Take a grinder and mix all the ingredients mentioned in the Masala Paste section including onions, chopped tomatoes, ginger, garlic, chilies, chopped cashews, coriander leaves, cinnamon, cloves, black pepper and coriander seeds. 2. Grind all the ingredients together and make a smooth paste. 3. It’s better not to add water while grinding. If the paste becomes very dry, then you can add 1 Tbsp water into it. 4. Keep the ground paste aside. 1. Heat ghee or oil in a pan. Add cumin seeds and sauté it till they splutter. 2. Now add the ground Masala paste and stir it continuously. But take care while sautéing the paste as it may splutter. If the paste will splutter too much, then cover partly with a lid till spluttering stops. 3. Stir and sauté for 5-10 mins or more on low flame till the oil separate from the paste. 4. Now, add all the dry powders – turmeric powder, red chilli powder, garam masala powder and stir everything well. 5. Add the peas or matar and stir again. 6. Now season with salt and add 2 cups of water. 7. Cover it tightly and cook till peas are cooked. Cook for 8-10 mins. 8. If the curry looks thin, then simmer till it reaches the desired consistency. The consistency should be medium, not very thick or thin. 9. Add the paneer cubes and simmer for 1 to 2 minutes on low flame till the paneer cubes get cooked. Now, you can add sugar and malai for giving it a slightly sweet taste. If you want you can add 1 tsp of ghee (if you are cooking in oil) just before removing it from the heat and mix well. 10. Matar Paneer is now ready to serve. Garnish it with chopped coriander leaves.